ADDIS ABABA, Feb 1 2015 (IPS) - While Africa’s economies are among the world’s fastest growing economies, hundreds of millions of Africans are living on or below the poverty line of 1.25 dollars a day, a principal factor in causing widespread hunger. One of the key issues discussed at the 24th African Union Summit which ended here on Jan. 31 was food security within the broader of framework of development towards Agenda 2063 – an agenda that touches on many aspects of where Africa should be 50 years from now. Food security is an important component of Agenda 2063 and with hunger one of the continent’s most pressing concerns, the agenda focuses on social and economic transformations necessary for its elimination, such as providing people with the needed skills and creating jobs to improve incomes and thus the livelihoods of people. Droughts, floods and other environmental disasters make it even more difficult for those exposed to sustain their livelihoods or even think about increasing their agricultural productivity. On the agricultural front, the emphasis is being placed on scaling up food production and making it easier for intra-Africa trade to take place so that food imports can be reduced. The overall objective is to end hunger throughout Africa within the next decade. Ending hunger also featured prominently in the African Union’s activities in 2014. Not only did it declare 2014 as “African Year of Agriculture and Food Security”, but African heads of state and governments also adopted the Malabo Declaration on “Accelerated Agricultural Growth and Transformation for Shared Prosperity and Improved Livelihoods”. At the same time, the “Renewed Partnership for a Unified Approach to End Hunger by 2025” was launched within the framework of the Comprehensive Africa Agriculture Development Programme (CAADP). The partnership is a joint initiative of the African Union, U.N. Food and Agriculture Organization (FAO), Institute Lula, New Partnership for Africa’s Development (NEPAD) Agency, Economic Community of West African States (ECOWAS), World Bank, World Food Programme (WFP) and U.N. Children’s Fund (UNICEF). The statistics show that hunger in Africa is real. FAO estimates that one in three people in sub-Saharan Africa are malnourished, but it is not only poverty that is responsible. Another challenge in the path of putting an end to hunger is global climate change, which is affecting arable land and destroying the harvest of farmers all over the continent. 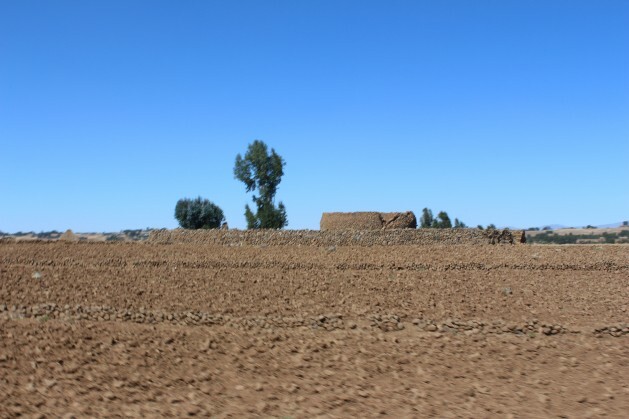 To place the issue of land on the development agenda, FAO has named 2015 as International Year of Soils within the framework of the Global Soil Partnership and in collaboration with the secretariat of the United Nations Convention to Combat Desertification. The aim is to increase awareness and understanding of the importance of soil for food security and essential ecosystem functions, including climate change adaptation and mitigation. Climate change has a major influence on the livelihoods of especially vulnerable smallholder farmers. Droughts, floods and other environmental disasters make it even more difficult for those exposed to sustain their livelihoods or even think about increasing their agricultural productivity. According to Sipho Mthathi, Executive Director of Oxfam South Africa, the global food system is inherently unjust. Meanwhile, African Union member states appear to be struggling at times with translating economic growth on the continent into policies that benefit the larger population. The pan-African organisation and its member states have been criticised for being slow in implementing declarations and other signed agreements. Erastus Mwencha, deputy chair of the African Union Commission, told IPS that many initiatives have been taken in the past to ensure access to food, such as having frameworks in place that ensure resilience when countries face drought. Thanks to the agreements made in 2014, he said, there are already clear improvements in the agriculture sector.